An analysis of 911 calls, radio traffic and security footage released by authorities Thursday reveals system failures amid the chaos and confusion between law enforcement during the Valentine's Day school shooting in South Florida. Interested in Parkland school shooting? Add Parkland school shooting as an interest to stay up to date on the latest Parkland school shooting news, video, and analysis from ABC News. The Broward County Sheriff's Office analyzed the materials and released a thorough timeline, along with audio recordings, detailing law enforcement's response and operations on Feb. 14, when a gunman opened fire at Marjory Stoneman Douglas High School in Parkland, killing 17 people and injuring others. The sheriff's office explained in its report that it operates Broward County's regional 911 system, but the city of Coral Springs isn't part of that and thus operates its own separate center. The city of Parkland contracts the Coral Springs Fire Department for its fire rescue services and the Broward County Sheriff's Office for its law enforcement services. According to the sheriff's office, all cellular 911 calls from Parkland are therefore routed to the Coral Springs Communications Center, which is then tasked with transferring those calls to the Coral Springs Fire Department, the Broward County Sheriff's Office or both, depending on the emergency. First responders gather after reports of a shooting at Stoneman Douglas High School in Parkland, Fla., Feb. 14, 2018. Broward County and Coral Springs were flooded with 911 calls as students, teachers and faculty at the high school in Parkland were under attack, according to the report. 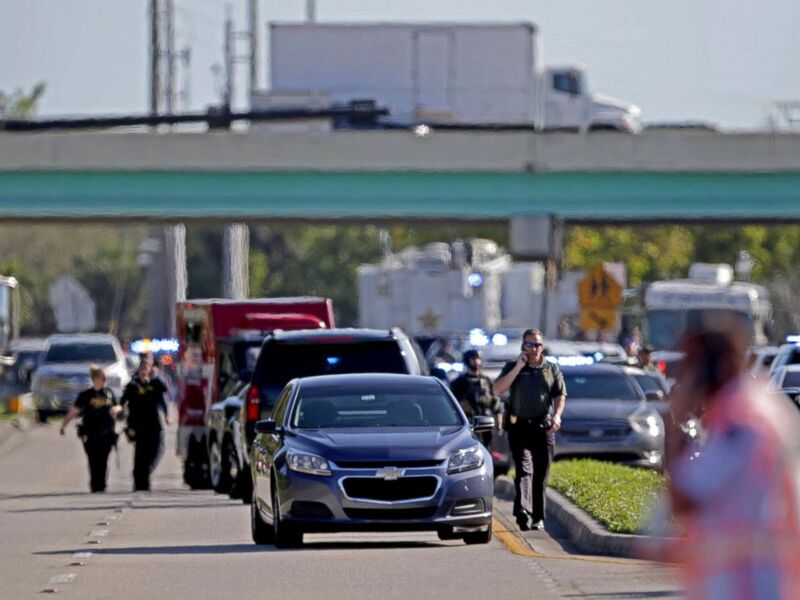 The Broward County Sheriff's Office received about 71 incoming calls during the incident, while the Coral Springs Communications Center received around 86, three of which were transferred to the Broward County Sheriff's Office for the law enforcement response. "Multiple gunshots are being fired; we can hear them in the background. Our 911 lines are blowing up. We have multiple units on the phone," a Coral Springs dispatcher says over the radio. Police and fire rescue vehicles converge following a shooting at Marjory Stoneman Douglas High School in Parkland, Fla., Feb. 14, 2018. 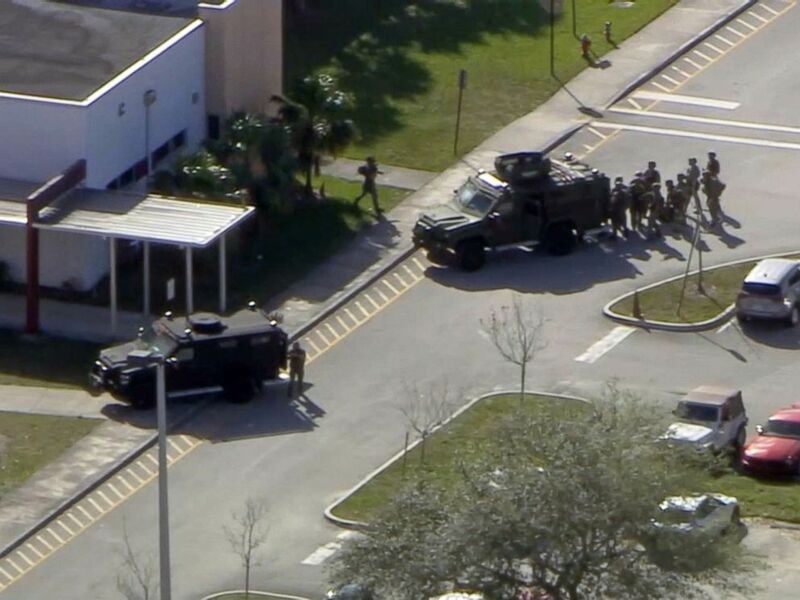 Dozens of deputies and officers arrived at the school, but some couldn't communicate with each other due to failed attempts to merge radio traffic between the Broward County Sheriff's Office and the Coral Springs Police Department, according to the report. They were unable to exchange descriptions of the shooter, his location and the weapon he wielded via a common radio channel. "White male with ROTC uniform burgundy shirt," a Coral Springs police officer says over the radio. "Last seen in the three-story building, north parking lot," the officer adds, referring to building 12. A few seconds later, a Broward County sheriff's deputy responds to an inquiry over the radio about the shooter's location: "We don't know, but we're heading in the building, in front of the 13 building, building 13." 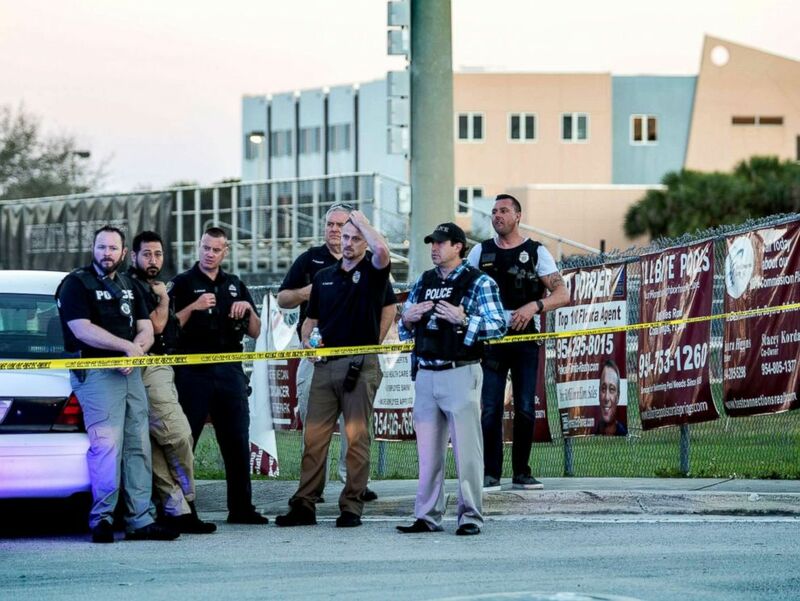 A group of police officers stand guard in front of the side entrance of the Marjory Stoneman Douglas High School after a shooting in Parkland, Fla., Feb. 14, 2018. The high radio traffic inundated the system, which the sheriff's office said is "nearing its end of life" and is expected to be changed out next year. At some point, officers couldn't transmit or receive some radio messages because the system was impaired, according to the report. "This impairment, otherwise known as 'throttling,' occurred at some point during the incident and hindered radio communications," the sheriff's office said in its report. "This issue is being further analyzed." After the shooting, authorities arrested the 19-year-old suspect, Nikolas Cruz, who had been expelled from Marjory Stoneman Douglas High School over disciplinary problems. The AR-15-style rifle allegedly used in the massacre was legally purchased by Cruz a year ago, authorities said. The Broward County State Attorney's Office on Wednesday announced a grand jury indictment charging Cruz with 17 counts of first-degree premeditated murder and 17 counts of first-degree attempted murder. Cruz appeared in court Friday, where a judge ruled he will continue to be held without bond on all counts. He is scheduled to be arraigned in court next week. ABC News' Rachel Katz and Ben Stein contributed to this report.